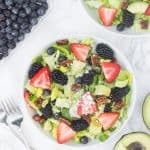 This red, white, blue summer berry salad is loaded with fresh fruit, topped with avocado slices, feta cheese, & candied nuts, and drizzled with a naturally-sweetened lemon poppyseed dressing. I love all of the seasons for different reasons, but one of my favorite things about summer (besides the obvious– no school and yes vacations) is all of the wonderful fresh produce. Specifically, I love the fresh berries. When they’re in season, they taste their best and the prices aren’t too bad, either. 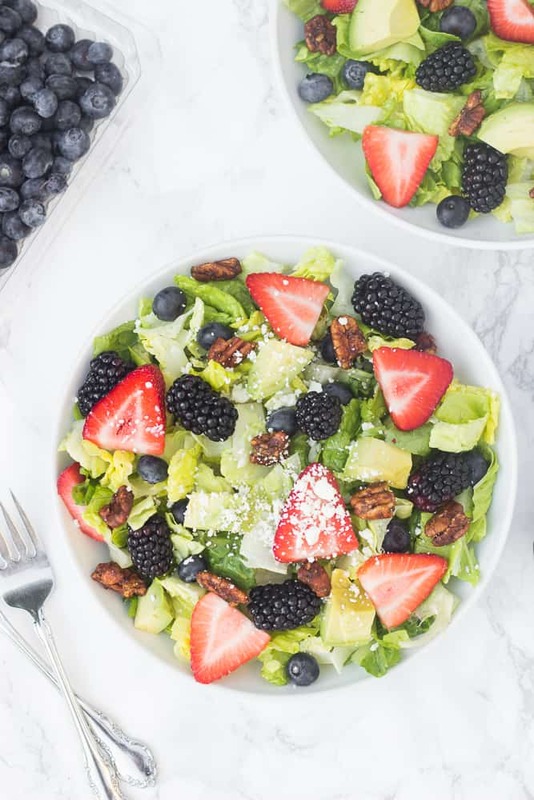 Lately, I’ve been making these single-serving blueberry banana pancakes, these whole-grain blueberry banana muffins and now, these red, white, & blue summer berry salads with lemon poppyseed dressing. These salads would’ve been perfect for the 4th of July, but I came up with the idea just a little too late. Oh well, I guess there’s always next year. For this year, though, I’ll happily continue to make and eat this salad until berries go out of season. Topped with grilled chicken, it’s a perfect summer meal. And to make it even better, I highly recommend making some roasted sweet potato wedges on the side. That’s my favorite way to turn a light salad with grilled chicken into a more satisfying, yet still super healthy meal. Or maybe it’s just a reason I’ve come up with to eat more sweet potatoes? Either way, it’s the best combo! If you make this red, white, & blue berry salad, feel free to let me know in a comment or take a picture and tag me @livbane on Instagram. Hope you enjoy! Wash and dry lettuce or spinach, as well as berries. 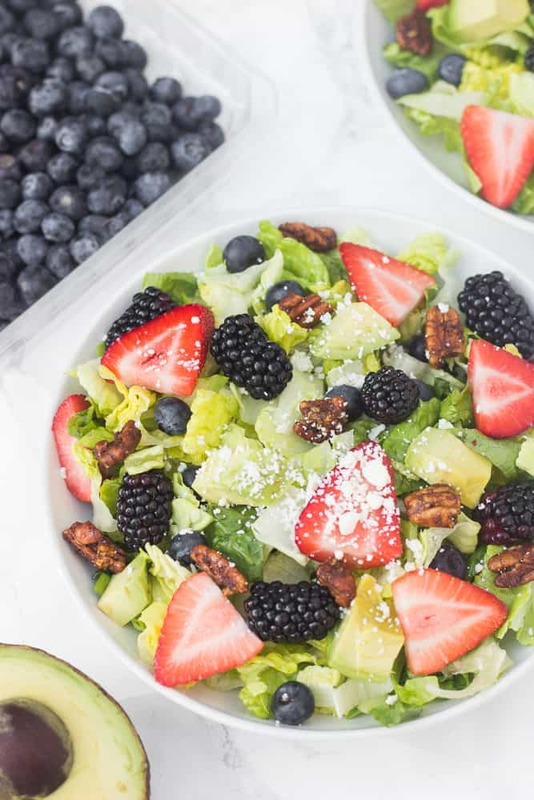 Place lettuce into bowls, top with berries, sliced avocado, feta cheese, and nuts. In a small mason jar or other container, mix together olive oil, lemon juice, optional lemon zest, honey, Dijon mustard, salt, and poppyseeds. Mix again just before using each time. Drizzle dressing over salad just before serving. You can make the dressing and candied nuts ahead of time to save time later! This is similar to my favorite salad at Pamara’s except you add the sweet potatoes and more grilled chicken to make the salad Moore of a meal. I don’t think I’ve ever had that salad at Panera but sounds delicious! Great salad that I could eat everyday. This definitely doesn’t just have to be a Fourth of July salad. The colors are so pretty, and I love candied nuts on any salad. How do you get those amazing pour shots? Haha! It’s taken me some practice to get the hang of the pour shots. The keys are a quick shutter speed, like no slower than 1/200 of a second, and a steady hand! this reminds me of panera’s salad. 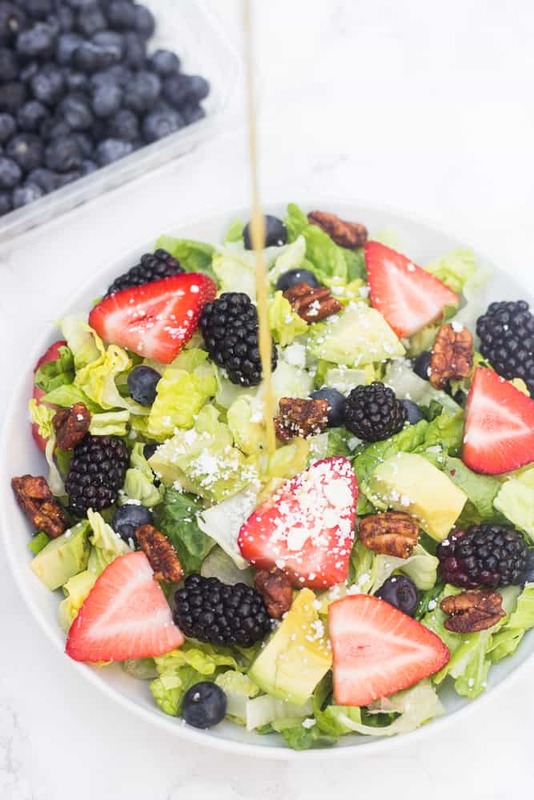 I loveee popyseed dressing and adding berries to my salads! This looks so pretty – and delicious! This is really good. Thank you for sharing this recipe. It’s colorful, interesting and the kids enjoyed it. It is one healthy recipe that’s light yet filling. I’m so glad to hear that your family enjoyed this salad, Sheila! Thanks for reporting back!